For the UK issue, see Bart Simpson 29 (UK). If You Can't Wiggum, Join 'Em! Presenting Eastern Europe's Favorite Cartoon Cat and Mouse Team: Worker and Parasite! 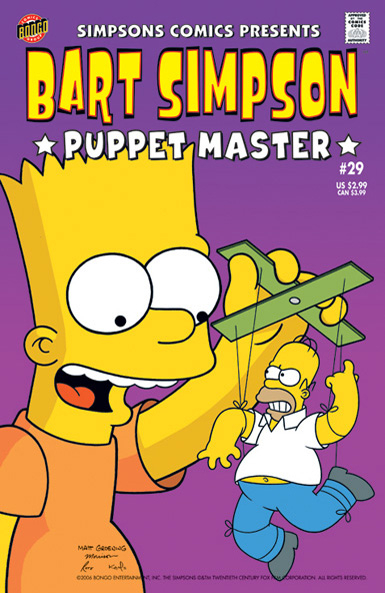 Bart Simpson Comics 29 was released in USA in April 2006. 1.2 Chief Wiggum & Ralph in: If You Can't Wiggum, Join 'Em! 1.3 Presenting Eastern Europe's Favorite Cartoon Cat and Mouse Team: Worker and Parasite! Chief Wiggum & Ralph in: If You Can't Wiggum, Join 'Em! Main article: If You Can't Wiggum, Join 'Em! Main article: Presenting Eastern Europe's Favorite Cartoon Cat and Mouse Team: Worker and Parasite!